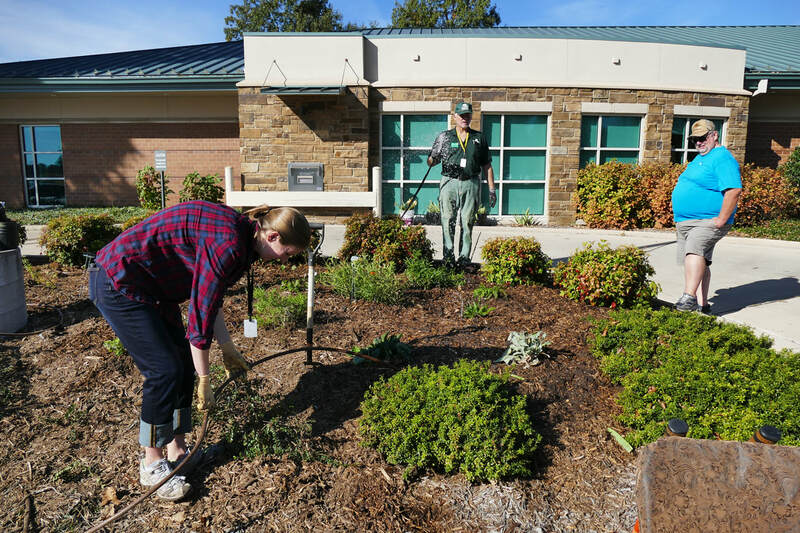 why create a pollinator garden? The Baxter County Master Gardeners and the Baxter County Library have entered into a partnership to create a pollinator garden at the Library.​ In addition to the MGs on the project, the library has provided volunteers to water and perform other tasks as needed. The Friends of the Library have kindly provided funding and helping hands. 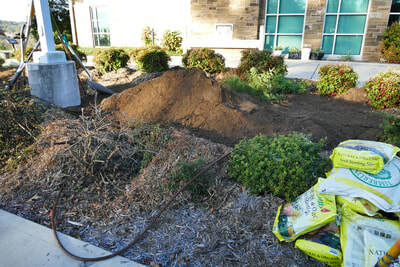 ​​This garden will be at the automobile book drop turn around. 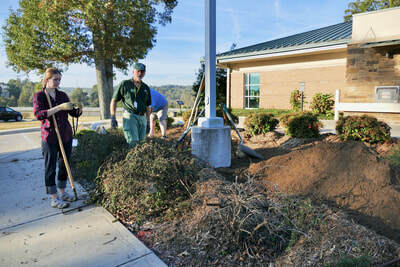 It will use plants that are known to attract all kinds of pollinators across the seasons. 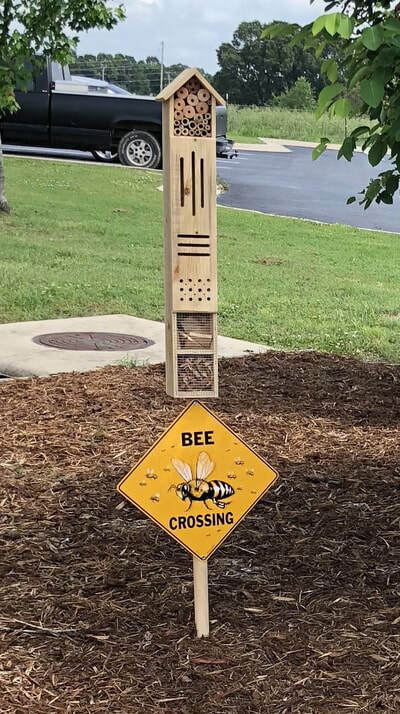 We hope to have educational information in the garden and in the Library to explain all about Pollinators, including the challenges they face in today's world. We have put some interesting links to more information about pollinators on our 'Links' page. Below is some information about the importance of pollinators and why we want to plant that type of garden. The National Academy of Sciences estimates one-third of human food and a greater portion of wildlife food comes from plants that require pollinators to produce fruits and seeds. Therefore, helping pollinators thrive yields tangible benefits for all of us. Common pollinators include birds, bees, butterflies, moths, flies, and beetles. Around our gardens, honey bees and hummingbirds might be the most noticeable. However, native wild bees, including bumblebees, mining bees, mason bees, sweat bees, leafcutting bees, and carpenter bees make invaluable contributions. Native bees are prolific pollinators -- better able to tolerate colder and wetter weather compared to honey bees -- they become active earlier in the spring and work longer hours each day. Habitat Loss: As wildlife habitats are converted for other uses, it destroys pollinator’s food sources and homes. Pesticides: Bees, butterflies, and most other insects are susceptible to pesticides. Exposure can kill, or gradually weaken the ability to fly, forage, and produce young. 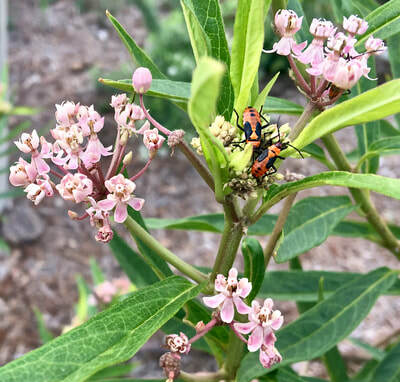 Invasive Species: Some introduced plants take over natural areas and displace native plants that provide a diversity of food resources and habitat types for native pollinators. Flowers provide nectar (sugar) and pollen (protein) for pollinators and their young. Because different pollinators may have different food preferences, variety is important. Recent research shows that areas that include 15 or more species of flowering plants increase bee diversity. Gardeners who want to conserve bees should strive to, as a general rule, provide a minimum of three species of blooming plants at any given time spring through fall. Place like flowers together to catch the attention of passing pollinators. Of course, you can't forget to plant host plants for butterfly caterpillars. Last fall, 2017 we started the garden. For planning purposes, we created 2 helpful documents (shown below) to guide our efforts. 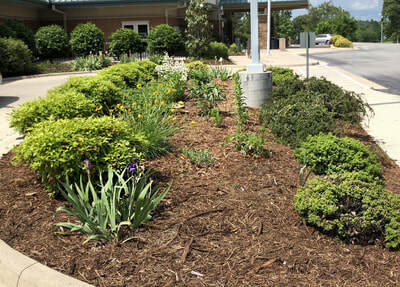 The 1st is a list of plants that are particularly pollinator-friendly. 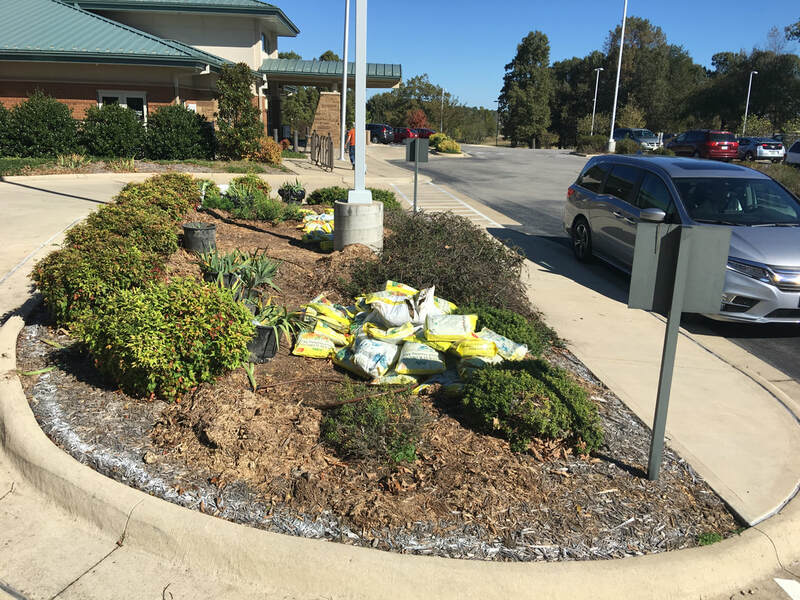 We wanted the list to include many native plants, knowing that designer plants frequently don't have much of a pollinator impact. That required some shopping for harder-to-find plants. 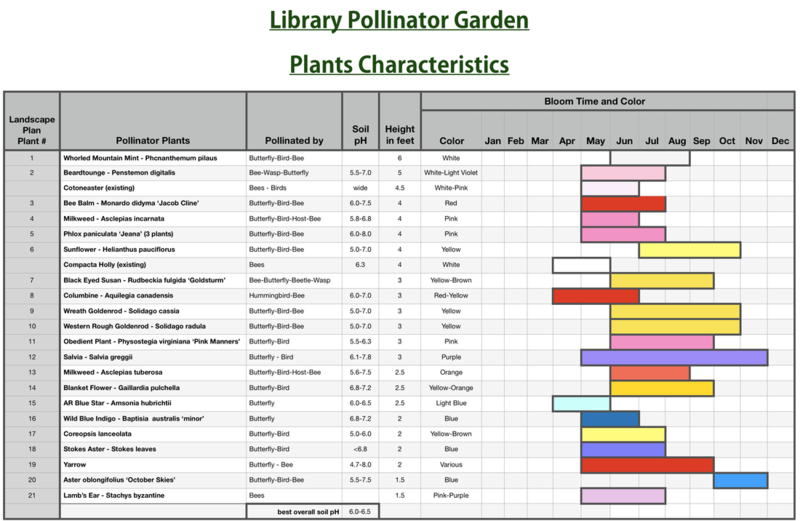 The end result is the following list,, with characteristics of each plant listed, including which pollinator they helped, pH, height, and color and time of bloom. ​The 2nd document we created is a scaled drawing of the proposed garden including the placement of all the plants in the plant list. The placement indicates only the number assigned to the plant, as listed in the first column of the plant list. The color of the bloom is shown with the number of the plant. 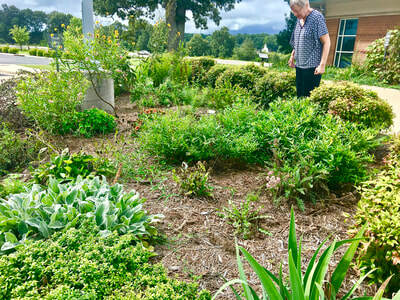 ​Following are some pictures of the first, and most important, day of creating the garden. 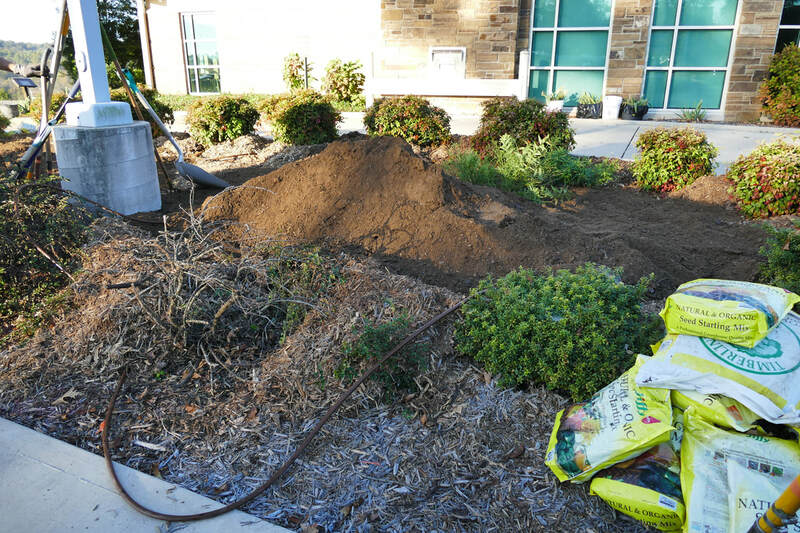 The dirt was brought in. Donated bags of soil amendments were added to the mix. Then the little plants were placed in their new home. Now we're ready for nature to do its thing, and next summer we hope to have some healthy, beautiful pollinator plants......and pollinators (birds, bees, butterflies, and others)! 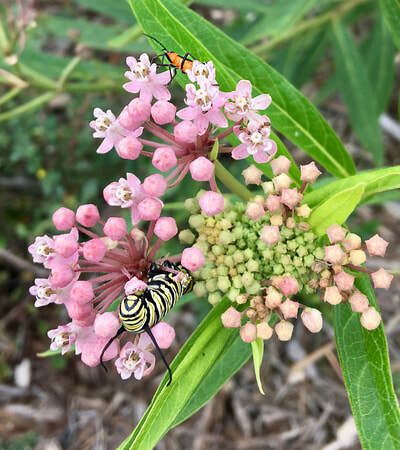 A monarch butterfly on our milkweed plant (#13). ​In early spring the committee met at the Library to plan for 2018. We adjourned to the garden to weed and check out how our plants overwintered. So far, so good. 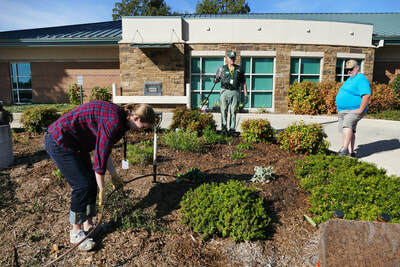 We hope to see lots of growth and lots of pollinator activity. We displayed a booth at the Library Plant Swap on April 21, 2018. Then for the month of June we utilized one of the glass display cases at the Library front hall to emphasize Pollinator Month. By August, 2018, in less than one year, we had our first visits from several species of butterflies, including the popular monarch butterfly pictured on the right.